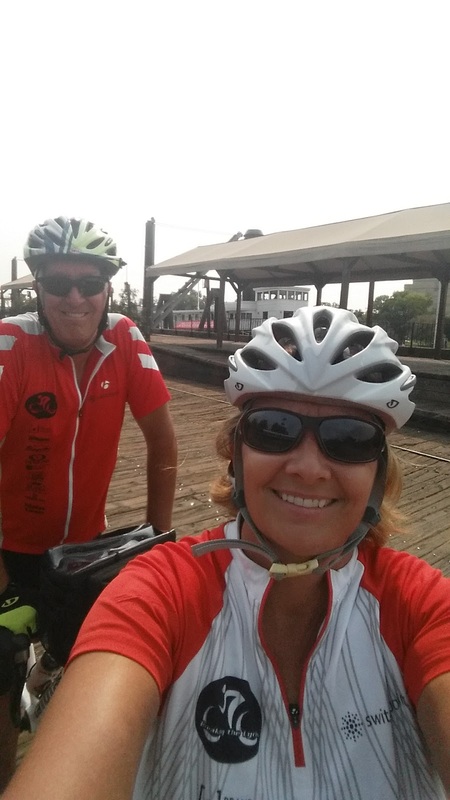 Breaking The Cycles: Day one of great adventure! This has been a perfect day. We left St. George on Tuesday, August 18. Had to stop and say goodbye to our favorite bike shop. Thanks so much to Bicycles Unlimited for all of their support- Mark, Nate and Cindy are awesome! Made it past Beatty, Nevada and camped on side of the road. 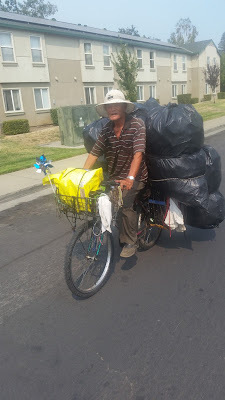 On Wednesday morning we set compass towards San Francisco and made a great new friend, "Mike on a bike", he was traveling around on his bike and had more duck tape then Walmart! His seat and handle bars were solid tape. LOL. 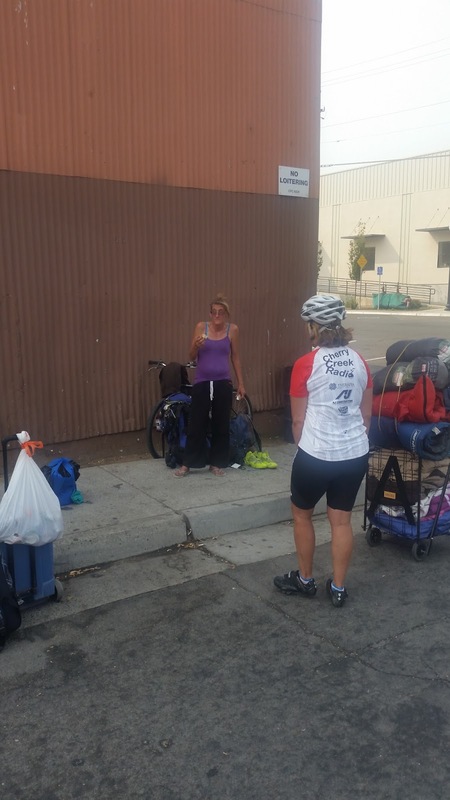 Very friendly and so we loaded him up with granola bars, pears, cliff bars, waters etc. We hit San Francisco during rush hour and it was CRAZY! Not a good spot for a large motorhome. The shelters were full and people were laying in every nook and cranny, even under cardboard in front of restaurants. I will have to say that this was a frightening venture in downtown. So after some clam chowder, we drove to our starting point. We got up early and dipped our tires in the water and then headed out. The fog was thick so it was a little chilly, which was so nice after all the HOT riding we have endured. The first 20 miles we got lost 3 times but quickly figured out how to read our maps. Baron met us in Winters, Ca for lunch and we saw another tandem. So I struck up conversation and and they asked if they could ride to Davis with us! A fantastic couple, Don and Diana and they had a beautiful bike. They loved our cause and will share it with the Davis riding club. 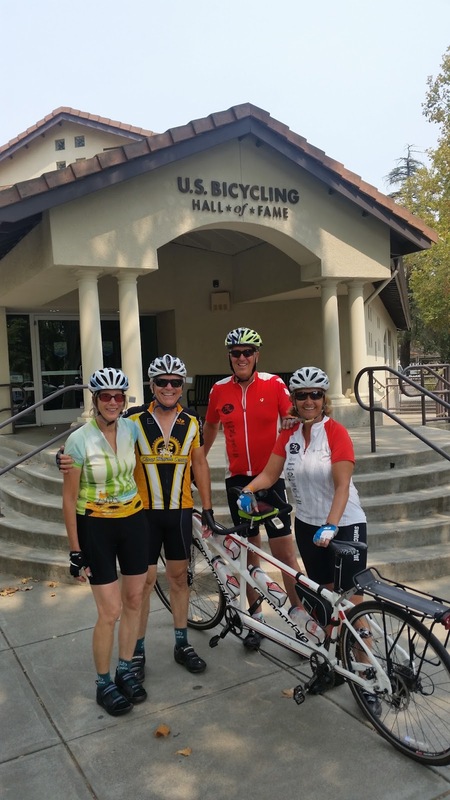 They were great to ride with and showed us the campus and the US Cycling Hall of Fame. New friends!!! After Davis, we headed to Sacramento and stopped at Loaves and Fishes. There was a couple of hundred people living on the streets because the shelters are all full. One nice guy, another Don, lives outside of town and rides in to collect cans and get supplies. He has been homeless 2.5 years. He came from Minnesota and thinks it is easier to survive in California. Can't blame him. We are so glad you did so well with your first day of 87 miles! Only 3,673 left to go! Ouch! That is a vivid reminder.